Looking for a full-sized pickup that's packing enough power to get your every job done and then some? Well then have we got two great suggestions for you to look at. The 2019 RAM 1500 and Chevy Silverado are both exceptional pickups that are more than able to meet your needs no matter what they might be. Though, just to be clear, there are a few differences between the two vehicles. So if you think you might need a little more information to decide between them, the continue reading below as we compare and contrast what each has to offer. There are two exceptional powertrain options available for the 2019 RAM 1500, both more than capable of delivering on your needs for power and ability. The standard engine for the 1500 is a 3.6-liter V6 engine that boasts 305 horsepower and 296 pound-feet of torque. Should that not be quite enough for you, there is also the option for all but the HFE trim to be upgraded to a 5.7-liter V8 engine that puts out the even more impressive 395 horsepower and 410 pound-feet of torque. Both of these engine options come matched with an 8-speed automatic transmission, 3.21 axle ratio, and rear-wheel drive. 4-wheel drive is an available option as well, though again with the exception of the HFE trim. With such astounding performance features, you're sure to get the most out of your engine no matter which you decide to put under your hood. While seeming to be offering a lot of choice with four engines that could be under the hood, the 2019 Chevy Silverado's options a bit limited by the fact that its engines are not so much choices as they are features depending on your chosen trim level. While each engine still delivers, that could mean choosing between the engine and certain features should one fit your needs better than another. The basic engine attached to the WT trim is a 4.3-liter V6 with a 6-speed automatic transmission that runs on 285 horsepower and 305 pound-feet of torque. The LT trim brings with it a 2.7-liter turbocharged 4-cylinder engine with an 8-speed automatic transmission that runs on 310 horsepower and 348 pound-feet of torque, just barely inching out the 1500's initial engine option. The LTZ and LT Trail Boss see the Silverado equipped with a 5.3-liter V8 engine and 8-speed automatic transmission for 355 horsepower and 383 pound-feet of torque. A 6.2-liter V8 that comes with a 10-speed automatic transmission comes with the High County trim, bringing with it 420 horsepower and 460 pound-feet of torque, making it the only one of the Silverado's powertrains that manages to outdo the 1500's more widely available 5.7-liter engine. There are not two or three but seven feature-packed trim levels available for the 2019 RAM 1500, each more than able to be just the right vehicle for your driving needs. The most basic trim and workhorse of the line is the Tradesman, which won't seem so basic when you notice that it comes with a Class III hitch receiver, USB inputs, 40/20/40-folding split rear seat, 18-inch steel wheels, rearview camera, 6-speaker audio system, push-button ignition, automatic headlights, locking tailgate, auxiliary audio jack, five-inch touchscreen, and vinyl flooring and upholstery. The HFE trim is similarly equipped to the Tradesmen, but is bolstered by rear-wheel-drive and overall increased fuel efficiency. The Big Horn trim sees a lot of new features added, such as floor carpeting, tinted windows, 18-inch alloy wheels, 60/40-rear split folding bench, and fog lights. The Big Horn can also be outfitted with several optional features like air-suspension, side steps, dual-zone climate control, an 8.4-inch touchscreen, power-adjustable pedals, LED tail and headlights, and 20-inch wheels. The Rebel trim level offers a more off-road design with features such as fortified shocks and suspension, fog lights, satellite radio, hill descent control, skid plates, 115-volt power outlet, a Class IV hitch receiver, power adjustable driver seat, an electronic-locking rear axle, 3.92 axle ratio, enlarged driver information display, LED headlights, and front row hooks. Amenities that are a bit more luxurious come standard with the Laramie, consisting of leather upholstery, front seats that are heated and ventilated power-adjustable pedals, keyless entry, a heated steering wheel, driver-seat memory, 40/20/20 front split bench, and rear parking sensors. The Longhorn trim is brimming with even more creature comforts such as a spray-in bedliner, power tailgate release, automatic wipers, navigation system, heated and ventilated rear seats, automatic high beams, chrome side steps, and 20-inch wheels. Lastly is the Limited trim level, which brings it all home with blind-spot monitoring, power-retractable side steps, chrome exterior trim adornments, rear cross-traffic alert, an adjustable air suspension, and premium-leather bucket seats. On paper the 2019 Chevy Silverado's 8 available trims does seem to give it a leg up on the RAM 1500, but it might be good to take a look at what each of the Silverado's trims actually give you before declaring one better than the other. The bare-bones WT trim is the most basic of the Silverado's trims, coming with a 6-speaker audio system, 7-inch touchscreen, air conditioning, 17-inch wheels, and smartphone integration. The Custom trim comes with tinted glass, heated power mirrors, 20-inch wheels, cruise control, and front tow hooks. Up next is the Custom Trail Boss, which adds four-wheel drive, 18-inch wheels, and a Z71 off-road suspension package. The LT trim gets Wi-Fi an upgraded information display, LED headlights, 8-inch touchscreen, and a steering wheel with inlaid audio controls. The RST trim brings a locking tailgate with power release, in-bed lighting, rear-window defrost, and second-row USB ports. The LT Trail Boss is equipped in a similar matter to the Custom Trail Boss, though with the addition of a specialized exterior trim, trailering upgrades, and dual exhaust. 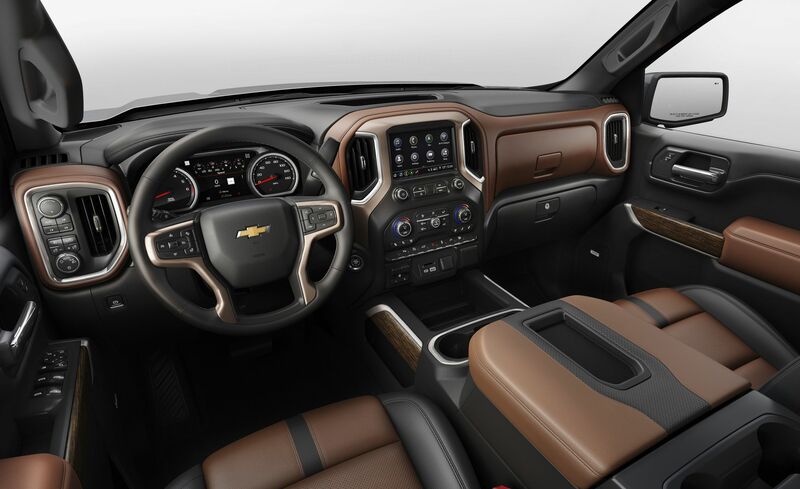 With the LTZ trim the Silverado gains a trailer brake controller, dual-zone climate control, leather upholstery, HD radio, heated power-adjustable front seats, on-board navigation system, 120-volt power outlet, and mirrors that are bother power-folding and dimming. Lastly is the High Country trim with its wireless phone charging, ventilated second-row seats, parking sensors, rear cross-traffic alert, a spray-in bedliner, 7-speaker audio system, blind-spot monitoring, 20-inch chrome wheels, and a power-sliding rear window. While both offer a lot that needs to be considered, with the Silverado seemingly offering more, the way we see it the 2019 RAM 1500 is actually the best choice. And choice is the very reason we're giving it the edge. The Silverado has more engines and trims listed as available than the 1500 does, but the engines are tied to trims so they aren't a choice in of themselves while the the trims themselves offer less than the 1500 trims do. So while you can get a good set of features and equipment with a Silverado, you have more control over what you're getting with the 2019 RAM 1500.